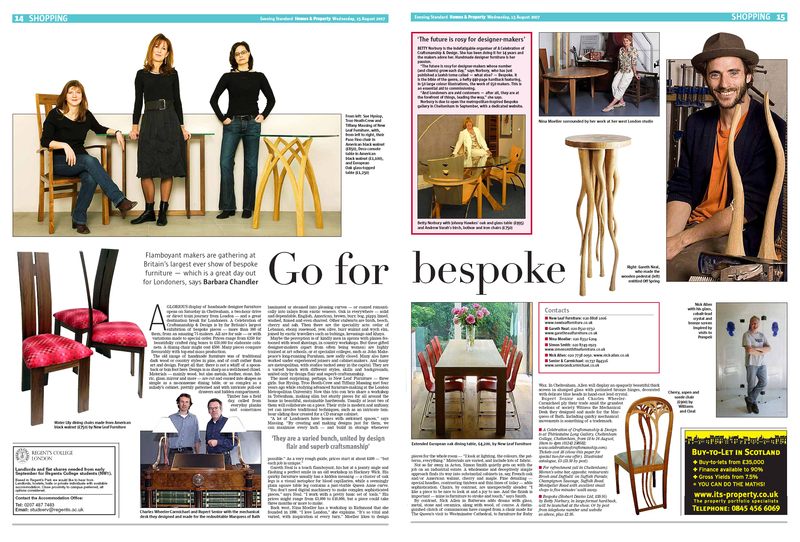 • New Leaf were selected and prominently featured in The Evening Standard's Homes & Property Section, in an article extolling the virtues of taking the bespoke route, and highlighting the opening of the Celebration of Craftsmanship and Design exhibition. Five New Leaf pieces were illustrated. Please click on image to read the full article. • New Leaf furniture has been featured in numerous quality newspapers and magazines, including The Independent, The Sunday Times, The Evening Standard, The Telegraph and InsideOut Magazine. Please click here for further recent press coverage. • Invited to exhibit for the second consecutive year at the Celebration of Craftsmanship and Design exhibition in Cheltenham - running from 18th to 26th August 2007,10am - 4pm daily. Please visit www.celebrationofcraftsmanship.com for further information. • Exhibiting at Hampstead Women's Club Marketplace on Wednesday 21st March from 9.30am to 12.00pm. The sale is open to the public and takes place at the Hampstead Town Hall, 213 Haverstock Hill, Belsize Park, London. • Displaying limited edition pieces at nomoregrey studios, 23-25 Redchurch Street, London E2 as part of the London Design Festival - 20th to 30th September 2006. • Selected as exhibitors at the prestigious Celebration of Crafsmanship and Design exhibition in Cheltenham - 19th to 27th August 2006. • Invited to exhibit as part of Launchpad at the celebrated international trade show Pulse at Earls Court, London - 21st to 24th May 2006. • Exhibiting at Metropolitan Works show, London - 5th to 18th May 2006. Please email: sue@newleaffurniture.co.uk if you wish to check current availability at retail spaces and galleries in the UK.